After a November 26th, 2018 joint inspection by FSM’s Department of Transportation, Communications & Infrastructure (TC&I) and Yap State Government, the MV Hapilmohl-1—commonly referred to as the H-1—was ready to be handed over to Yap State. On November 28th, 2018 after a luncheon attended by President Peter M. Christian, Governor Tony Ganngiyan, Senators Isaac Figir and Joseph Urusemal, and other distinguished guests representing all three branches of Yap State’s Government, Yap received operation rights to the ship once more. “The President boarded the ship before the luncheon…he was pleased, everybody was pleased, even shocked to see the ship in such good condition,” said Secretary of TC&I Lukner Weilbacher during a December 6th, 2018 meeting. The H-1is a Chinese-manufactured ship owned and operated by the FSM National Government and Yap State Government respectively since 2007. Historically its had a monthly schedule of continuous back and forth visits from Yap proper (Waab) to its outer (neighboring) islands, though the ship hadn’t been dry-docked for “about 4-5 years,” according to Secretary Weilbacher, until it arrived in the Philippines this past April, 2018. 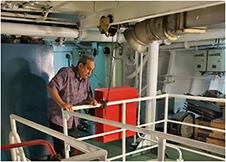 Under President Christian’s administration, the FSM National Government has tried to repair two ships—the MV Hapilmohl-1(H-1), based in Yap, and the MV Chief Mailo, based in Chuuk. These ships are owned by the FSM National Government but are operated by Yap State and Chuuk State respectively. Typically the FSM sends bids for dry-dock services in Japan, but in this case it was impossible because Japan doesn’t have the Chinese manufacturers’ representatives in their country. Secretary Weilbacher took the initiative to find some way to ensure these ships could be operational. He learned of a shipyard in the Philippines, where TC&I received cost estimates for overhauling the H-1 and Chief Mailo. The Government requested and received funding from Congress, and then in April 2018 the H-1 began its overhaul. 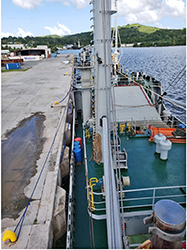 With continuous on-sight supervision in the Philippines by Captain Lee May and Chief Engineer Joanes Jackson, and frequent coordination visits by other TC&I staff in the Marine Division, the ship received genuinely substantial upgrades and improvements. H-1 conducted a short trial run after the turnover where it visited Ulithi Atoll and Fais, bringing the former much needed fuel for its generators. As of December 6th, 2018 H-1 is completing her short trip and will return to Yap and prepare for her next field trip to visit all the islands in Yap State—all the way to Satawal and back. The MV Chief Mailo is the next ship scheduled to be dry-docked in the Philippines. The Government of China has agreed to donate another ship. After some of the initial bidding in China is completed then our countries will work together to design the new ship. Meanwhile, one of the vessels owned and operated by the FSM National Government—the MV Caroline Voyager—has reached her maximum useful life and is recommended for replacement. “For that, we’re working with the Government of Japan,” said Secretary Weilbacher.